The Four Kinds of Genius: What Type of Leader Are You? You have a natural way to lead your team, grow your business and excel at your job. The problem is, right now you may be doing the exact opposite. If it feels like hard work, you’re already doing the wrong thing. Try this little experiment: Fold your arms. Look whether you have folded your left arm over your right arm or your right over your left. Now do the opposite: Fold your right arm over your left arm or your left over your right. Does it feel comfortable? For most people, it doesn’t; for some, it is even hard to do -- it feels…unnatural. That’s because you’re doing the wrong thing. That’s not to say there is one right way to fold our arms. There is only your natural way: Your Genius. The idea of the four geniuses dates back five thousand years and connects to the four season and four frequencies found in ancient Chinese and Indian thought. Aristotle and Plato identified them, too. Our genius connects us to how communicate, and how we market ourselves and our products or services differently. This is why one-size-fits-all books that insist on just one way to lead or manage will often contradict each other. We all have a mix of geniuses, but we have one that is more dominant and when we focus at it, we can focus on our natural leadership style that suits our strengths -- and allow others to do the same. Here are the four geniuses. Which one of these do you resonate with the most? Dynamo Geniuses include Richard Branson, Bill Gates, Steve Jobs, Michael Jackson, Beethoven, Thomas Edison, and Albert Einstein. Blaze Geniuses include Bill Clinton, Jack Welch, Oprah Winfrey, Ellen DeGeneres, and Larry King. Related to “Summer” energy, all of these charismatic people focused on their strengths in leadership and connections. They ignored those who criticized them for not focusing on the numbers or not planning enough. Tempo Geniuses include Warren Buffett, George Soros, Woodrow Wilson, Gandhi, Nelson Mandela, Mother Teresa, and Michael Phelps. Related to “Autumn” energy, all of these people focused on their strengths in their senses and perseverance. They ignored those who criticized them for not being more forceful or politically astute. They didn’t worry that they liked being extra careful and wanted to take more time over things. Steel Geniuses include famous entrepreneurs such as John D. Rockefeller, Henry Ford, Ray Kroc, Larry Page, Sergey Brin, and Mark Zuckerberg. Related to “Winter” energy, all of these people focused on their strengths in systems and in managing data. They ignored those who criticized them for not having better social skills or being more sensitive. 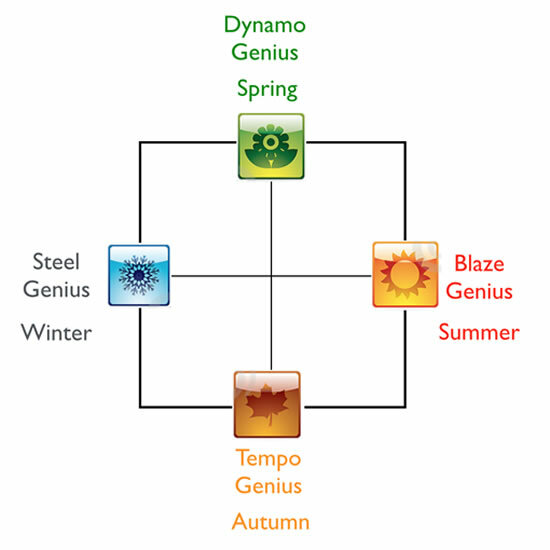 Discover which of the four geniuses you are by taking the free genius test at mygeniustest.com. Then test your team, and support each of your employees to follow their genius. Roger James Hamilton, author of The Millionaire Master Plan: Your Personalized Plan to Financial Success (Business Plus, 2014), was born in Hong Kong and educated at Trinity College, Cambridge University. He became an entrepreneur before leaving college; he estimates the cost of his entrepreneur education was far greater than his academic education, losing many millions through his failures before achieving success. Today he owns and runs businesses in publishing, property, event management, resort management, training, coaching, mentoring and online education. Behind all of Roger James Hamilton's companies and content is his mission of "World Wide Wealth": The power to grow our flow individually and collectively. Roger believes we each have the power to develop our own financial literacy to grow our own wealth, from which we then have the power to help those around us. Maybe you don't exactly feel like a genius. Maybe the best you can hope for is to feel a notch or two above average—on a good day. That's fine. Sometimes the demands of work and life are such that you can't really stop to evaluate just how well your own development is coming along. Could you use some help checking in on, well, yourself? Sign up for exclusive Monster Hiring advice and we’ll send you the latest recruiting tips, hiring trends, management strategies, and even some awesome Monster deals. Sometimes all it takes is a little sage advice from the experts at Monster to help you get back on track.